Derek Flood received his BFA in Painting from University of Illinois at Urbana Champaign. He has also had intensive training at the School of the Art Institute in Chicago where he focused on classical and computer animation. He has over 10 years of experience in character animation, directing, and photorealistic lighting/texturing. 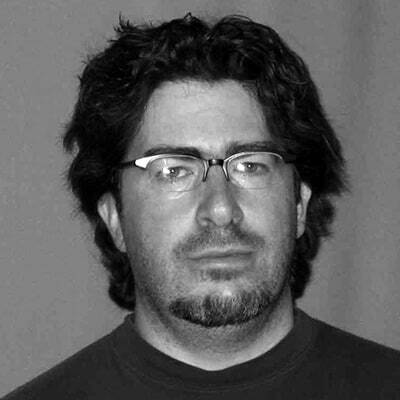 Prior to becoming full-time faculty, Derek was an Independent Director and Animator at Sharktacos Studios, which he founded in 2003. Derek has also worked at Dreamworks and various companies in Munich and Berlin. Film credits include The Pianist and Shrek2. Derek has been the recipient of the Audience Favorite at Animago, Germany’s premier CG animation award. His Say Cheese has been an official selection at festivals and they include SIGGRAPH Electronic Theater, World Animation Celebration, Anima Mundi in Brazil, Edinburgh International Film Fest in the UK, Art Futura in Spain, Hiroshima in Japan, and many more. Say Cheese has been aired on television programs in Holland, Japan, the UK, and the US.